San Mateo, April 19th, 2017 – ENFOS Inc., provider of the world’s most widely-used enterprise environmental liability management software, today announced the ENFOS Experience 2017 Conference, which will take place September 14th-15th, 2017 in Chicago. The two-day event (plus networking reception on September 13th) will be held at The Langham Chicago and includes an all-star lineup of speakers from the Defense Logistics Agency, Ashland, Chemours, Total, Georgia-Pacific, Cumberland Farms, Valero and more. 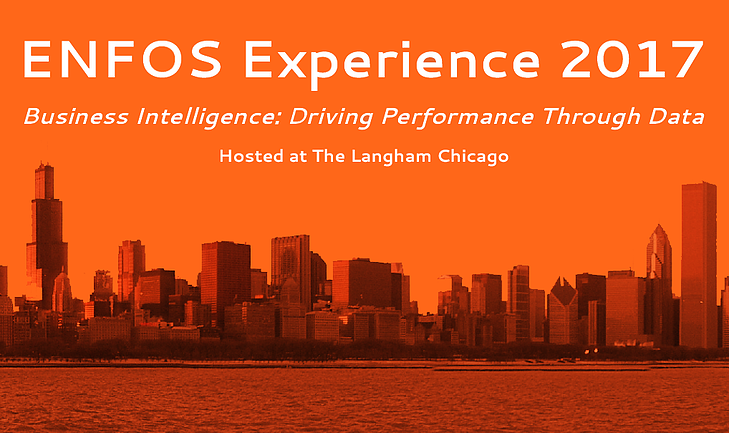 ENFOS Experience 2017 is themed “Business Intelligence: Driving Performance Through Data” and will be the definitive conference for executives, remediation professionals, and supporting roles such as finance and IT, to share insight about their data stories, results, and methodologies. Attendees will benefit from a series of high-impact speeches, discussions, and technical sessions centered on transforming data into meaningful and useful information to improve decision-making and insights into risk and performance. The definitive collaborative remediation conference - including a focus on three primary levels of BI; remedial technology, project-level, and enterprise-level. Over 20 presenters from industry, consulting, and technology showcasing their data stories. Breakout sessions focused on how ENFOS solutions are used to solve key business problems with BI. Two networking events (Wednesday evening reception and Thursday evening dinner cruise on Lake Michigan) for the 150 attendees and guests..
Venue is the world-class Langham Chicago hotel in the River North neighborhood. ENFOS is also proud to announce the sponsors of ENFOS Experience 2017: CH2M, Arcadis, Pace, and AECOM. Also: Take our BI Survey! Help us get a good look at where the remediation industry currently stands in terms of BI. Results will be presented at the conference.